visit. specials of the week. our catalogue. new varieties. garden store. about. Feel free to search our online catalogue to the right or download your own pdf of the catalogue below. ABELMOSCHUS manihot This species is often used as an architectural specimen in the garden reaching 4-5 feet by late summer. Large, 5", soft yellow petals surround a throat of deep purple. 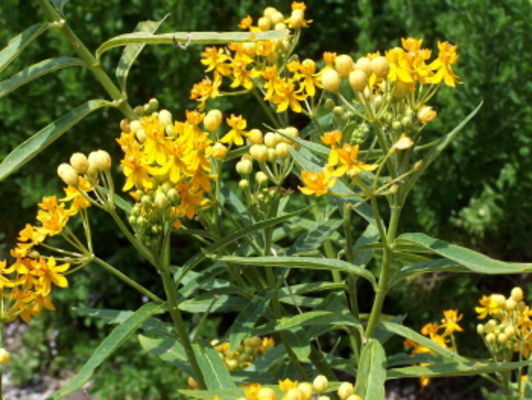 Large, palmately divided, hairy leaves and long seed pods add interest. Loves full sun and hot summers. 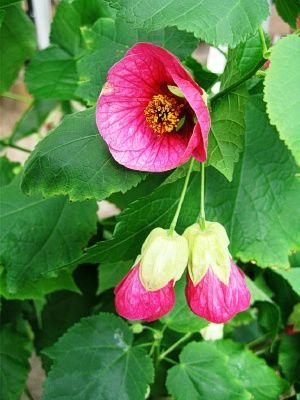 ABUTILON (Flowering Maple) This genus of the mallow family are extremely heat tolerant. 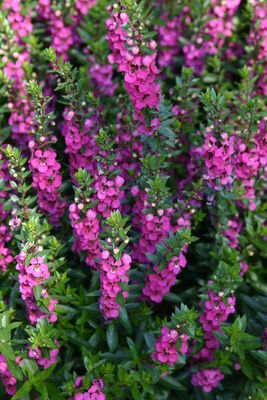 Great for your container or in the ground, flowering non-stop all summer until a killing frost. Full sun, evenly moist soil and weekly fertilization. Some can be overwintered as house plants. 'Biltmore Ballgown' A spectacular heirloom variety, featuring yellow blooms with bold crimson veining. 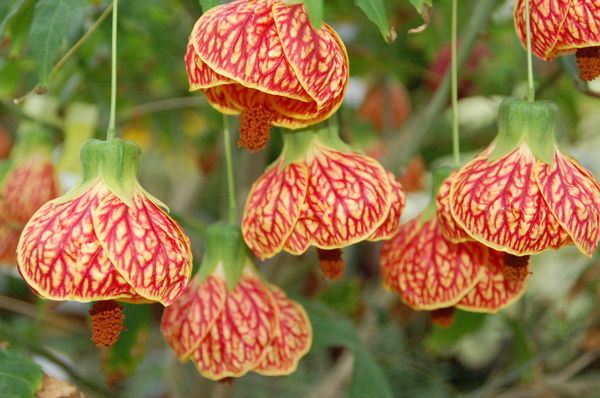 Bell shaped flowers resemble an evening ball gown that dance below dark green leaves. 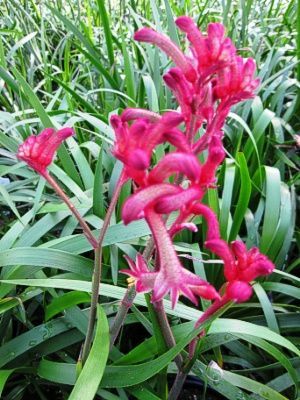 'Dwarf Red' Upright grower 18-24" with small bright red flowers, heavy bloomer. NEW! 'Heronswood Lipstick' A delightful sprawling upright habit with beautiful midsized flowers in a lovely shade of magenta-pink. 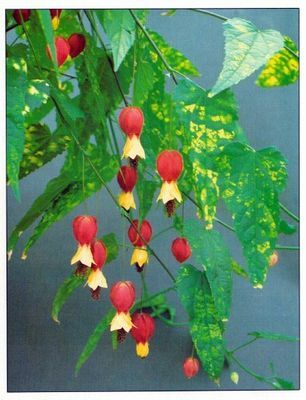 megapotamicum 'Chinese Lantern' Trailing variety with 1" red, yellow and black bell shaped flowers. Dark green leaves mottled with yellow. Good substitute for vinca vine or ivy. 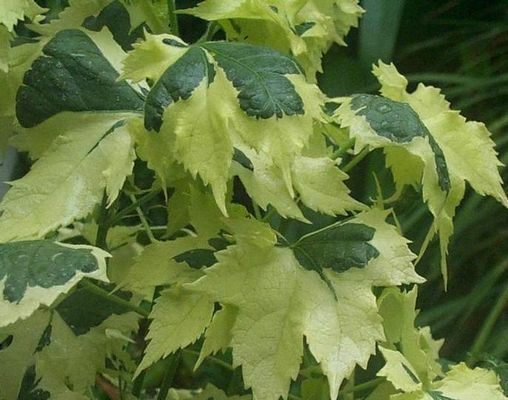 'Thompsoni' Maple-like leaves are dappled with cream and a profusion of apricot blooms. 18-24"
'Savitzii' Upright growing 2-3', grown mostly for its incredible foliage. 4 by 5" leaves almost entirely white with just a central splash of green. Pale apricot flowers. 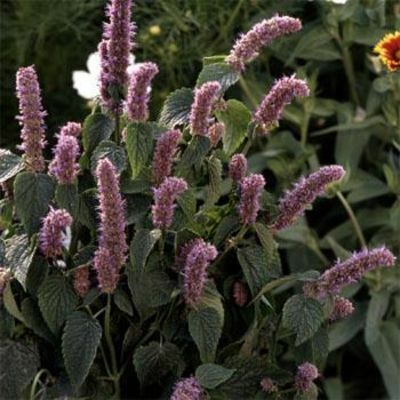 AGASTACHE (Hyssop) Simply some of the best plants we grow. Colorful spikes are displayed all summer long above aromatic foliage. These die-hards handle heat and drought conditions so well they hardly break a sweat. Tubular florets are loved by hummingbirds and butterflies. Technically perennials, but tender enough that we offer them here with our annuals. Full sun, average to dry soil. 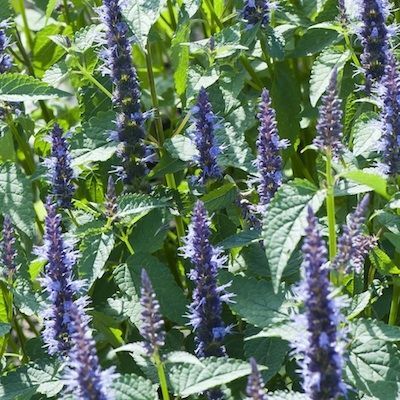 'Astello Indigo' Widely adapted, 20" plants thrive in cool or hot weather. Long lasting, deep blue flower spikes July-October. Disease resistant leaves with "root beer" fragrance; Fleuroselect Gold Medal Winner. NEW! 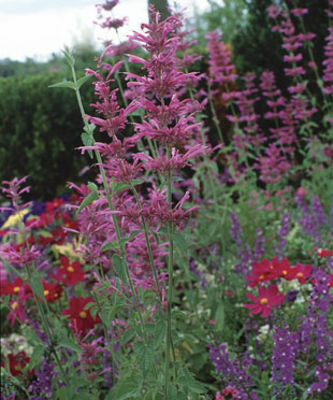 kudos series Kudos’ is a dwarf series of Agastache that are very well branched, bloom all summer and are almost fully resistant to downy mildew. H 17-20". Offered in 'Ambrosia', creamy coconut, pale orange and light rose pink spikes, colors change constantly, 'Coral', 'Mandarin' and 'Yellow'. NEW! 'Morello' Amazingly huge, dense spikes of deep burgundy rose that bloom from spring through fall. 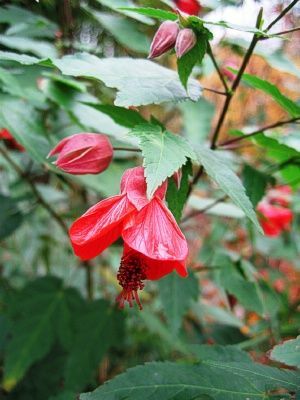 Showy, dark foliage in cool temperatures will extend the beauty. Good mildew tolerance. H 27-33"
NEW! sunrise series Bright, two-lipped flowers and bracts on tall spikes above lemon-scented foliage. Offered in Orange, Red, Violet and White. 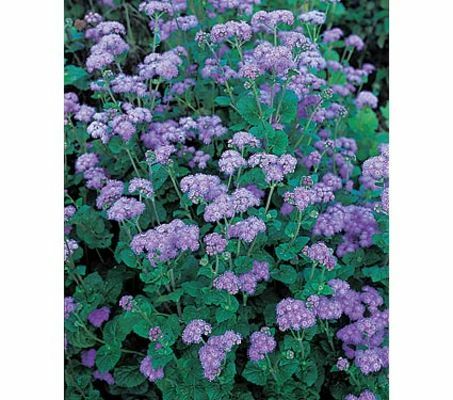 H 18-24", spread 18"
AGERATUM houstonianum A popular bedding plant, native to Mexico, with small, puffy clusters of flowers produced all summer until frost. Attracts butterflies. Full sun to part shade, average soil. 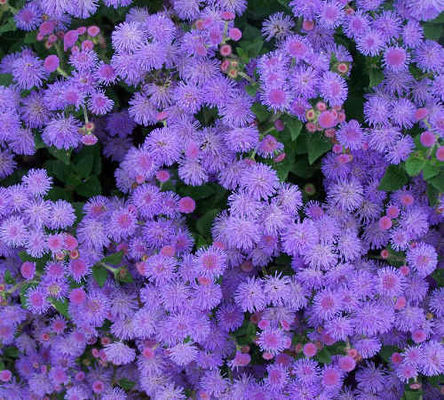 'Aloha Blue' Fluffy puffs of lavender-blue flowers are densely clustered above dwarf, uniform, 5-6" plants. 'Blue Horizon' Tall, sturdy stems good for cutting. Lavender blue flowers. 24-30"
NEW! ALOCASIA 'Portora' One of the largest of the elephant ears! Portoras' wavy leaf dimensions will easily reach 3 x 6 feet on 6 foot stems. 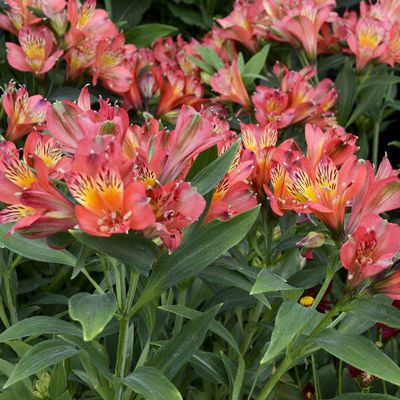 ALSTROEMERIA (Peruvian Lily) These flowers which resemble miniature lilies are a must for your containers or in garden beds, in full to partial sun locations. All summer bloomer, also makes a long lasting cut flowers. 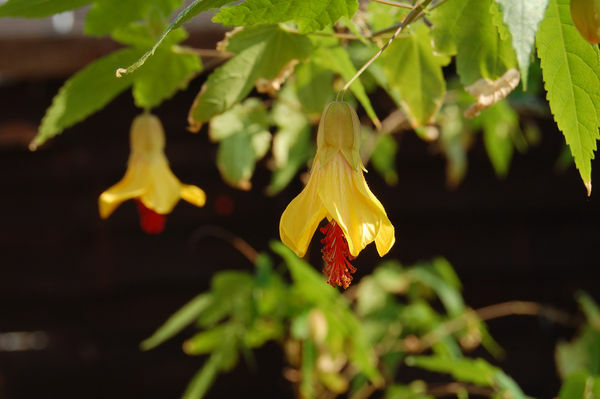 'Colorita Fabiana' Large flowers, pale butter yellow with garnet markings, continuously blooms from early spring till early winter. 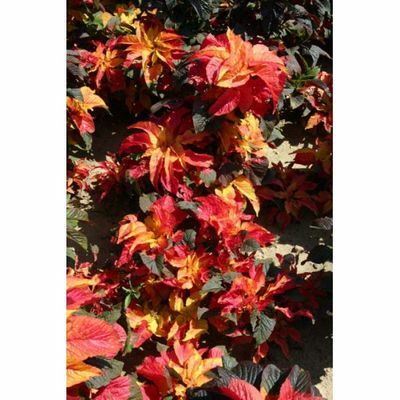 Compact plants, H 12-15"
'Inca Collection Mix' We are offering an assortment of colors for this fabulous plant: Peach, Pink, Purple, Red and Yellow. 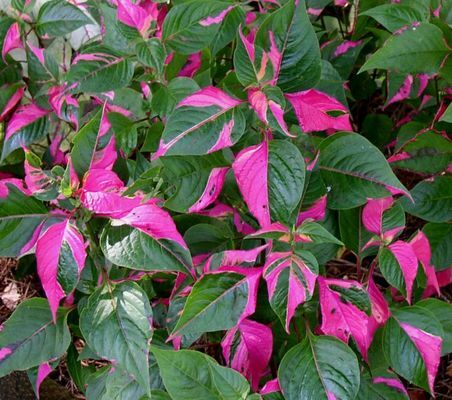 H 12-20"
ALTERNANTHERA An unusual and striking foliage plant with narrow, small colorful leaves. Great companions to bold colors your mixed containers. Easy to grow in full sun or part shade. 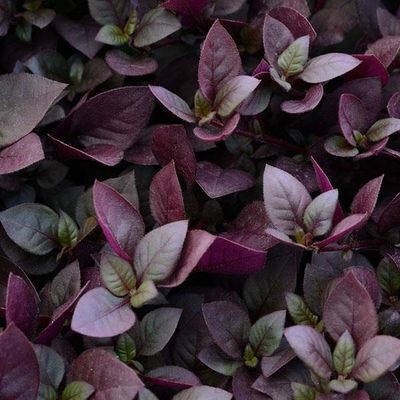 brasiliana 'Purple Prince' Plant this compact Alternanthera with ruby-red to burgundy-maroon leaves and stems from spring through fall, in your best hanging baskets, tall flowerpots, tubs, and annual beds. A heat-lover. H 10-16", spread <2'. NEW! 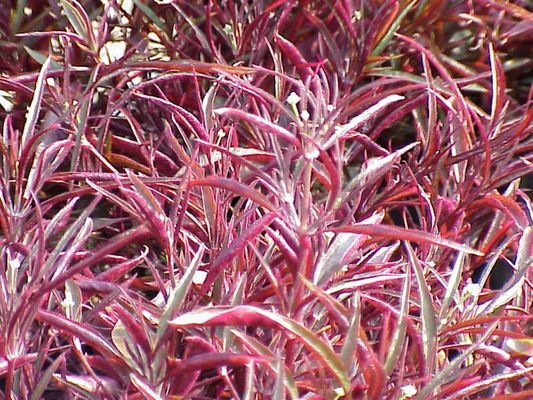 ficoidea 'Red Threads' Deep rose burgundy foliage on a compact form with small, finely cut leaves. Perfect for edging a container or border. H 4"
'Partytime' Mint green leaves with splashes of hot pink. Upright and well branched. 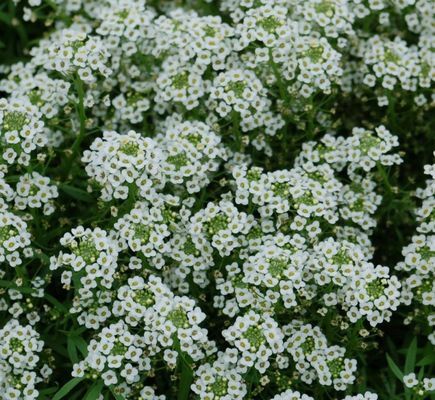 15-18"
ALYSSUM lobularia maritima A valued bedding plant with small leaves, a dense, mounded growth habit with fragrant flowers produced all summer to hard frost. Perfect for edging, low beds, and planters. 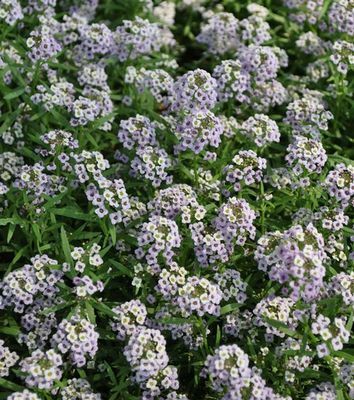 Regardless of variety, Alyssum continues to be a best seller year after year. Full sun to part shade. clear crystal series This series delivers superior vigor, larger flowers and stronger garden performance. Available in lavender, purple and white. H 6-10" and 12" spread. 'Lavender Stream' An ideal alyssum for mixed containers. 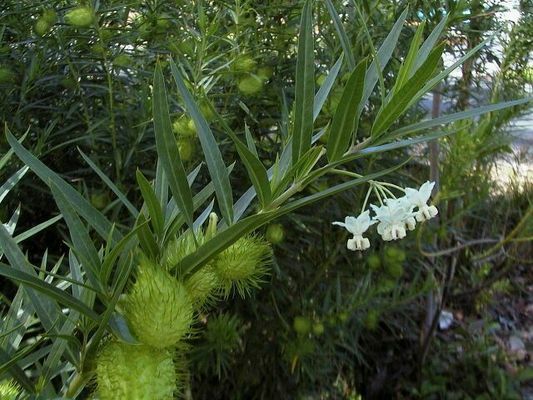 Fast growing and floriferous, ball shaped plant with a wonderful honey scent. Plants are heat tolerant and grow throughout the summer. Lavender colored flowers. 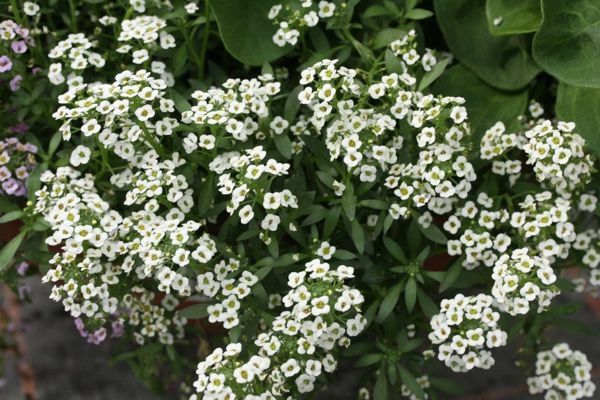 H 12"X12"
'White Stream' Plant this sweet smelling alyssum in containers, hanging baskets or as a ground cover. 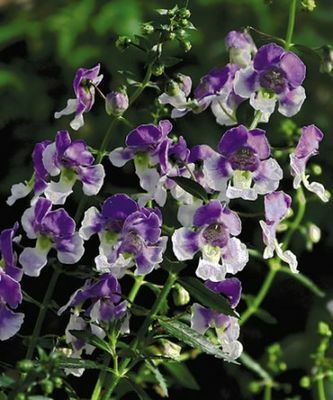 A heat-lover, fast growing display of profuse, dainty, white clusters of flowers. H 12" and 12" spread. 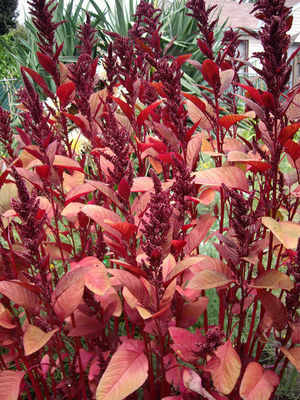 AMARANTHUS Very showy plants with brightly colored, velvety leaves and dense clusters of flowers. They make a bold statement in the garden, and make delightful cuts both dried and fresh. 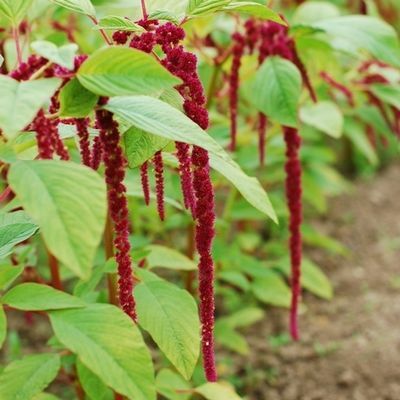 Amaranthus thrives in sun and average to poor soil. 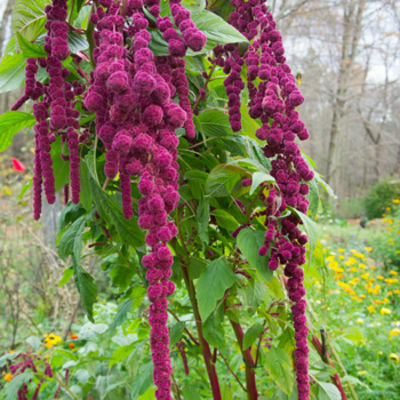 caudatus (Love-Lies-Bleeding) Flowers that bloom in narrow, drooping, tassel-like, panicles. 'Hopi Red Dye' Used by the Hopi Native American tribe as a ceremonial food dye to make red cornbread. Huge upright, dark maroon flower heads on dark red stems and leaves. Super impact! 3-5', Heirloom. AMMI (False Queen Annes Lace) Ferny, fresh green foliage complements the large pure white. A graceful weaver from May-June. Sun to part sun. 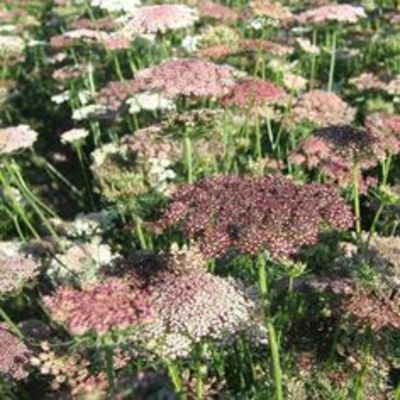 'Dara' Attractive 3-5" lacy umbels atop strong stems. Flowers in shades of dark purple, pink, or white. Highly productive with 7-15 stems per plant. Long lasting in bouquets. 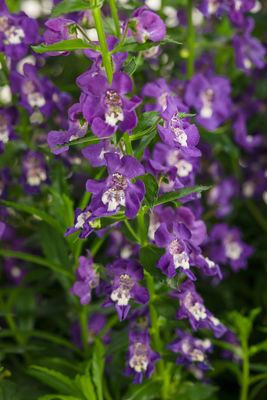 ANGELONIA augustifolia Being native to Mexico and the West Indies this is a sun and heat-loving plant. Abundant spikes of small, orchid-like flowers are produced over neat clumps of narrow leaves. Easy to care for, this is a no-brainer. angelface wedgewood series Bred for superior performance, large flowers and an upright branching habit. Sweetly fragrant. Offered in 'Blue', with purple-lavender blooms and NEW for 2019 'Steel Blue', light silvery lavender. Blooms all season. Great cut flower. 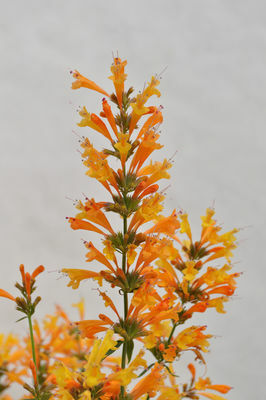 H 18-24"
archangel series Bushy plants with large, gorgeous flower spikes in vibrant colors. 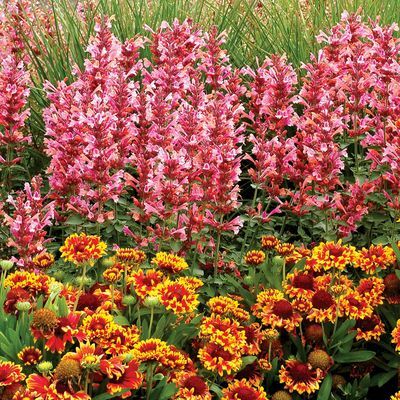 Blooms are three times bigger than other varieties! Available in Cherry-Red, Pink, Purple, Raspberry and White, and NEW for 2019 Blue-bicolor. H 12-14"
super series The super series is perfect for long season color. Each classic, whimsical flower spire will be 16-20" tall atop well branched vigorous plants. Makes an outstanding cut flower as well. Available in Blue, Pink and White. 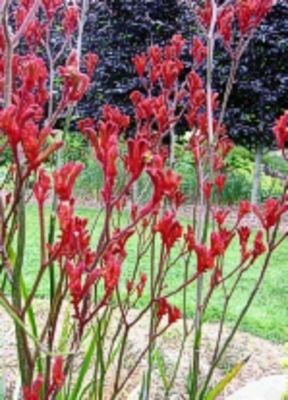 H 30-40"
ANIGOZANTHOS (Kangaroo Paws) Native to southwestern Australia, these unique blooms look similar to a kangaroo paw. Great cut flowers. Likes full sun and well drained soil. big roo series Tall growing green strap like leaves and tubular blooms. Available in both, Red and Orange. 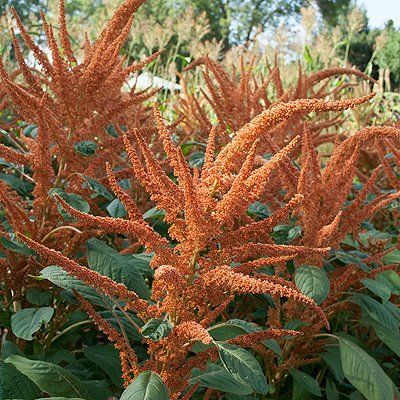 H 30-36"
jo jo series Offered in Orange and Red fuzzy flowers, compact growing to a height of 12- 15”. kanga series Mid sized fuzzy flowers. Available in Burgundy, Pink and Yellow. H 18-24"
ANISODONTEA 'Elegant Princess' (Cape Mallow) Cup-shaped, hibiscus-like, pink-lavender flowers, on tall, bushy, robust plants with silvery leaves. 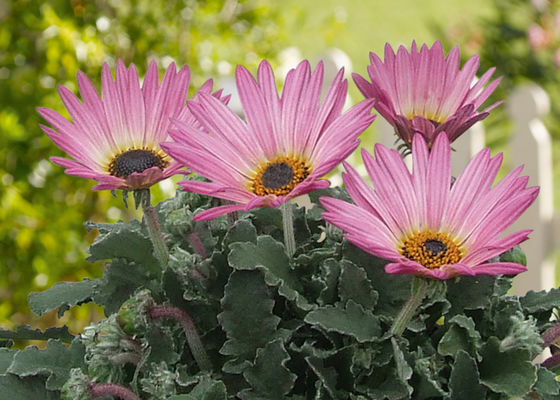 Mixes well with others to add height to a container. Heat tolerant, no deadheading necessary. 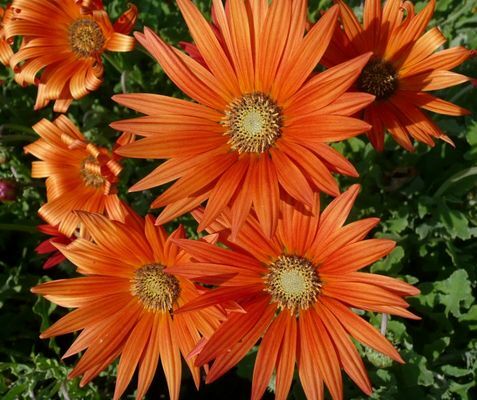 H 18-24"
ARCTOTIS (African Daisy) Native to South Africa, these bushy plants have basal rosettes of foliage and bear striking daisy-like blooms. Thrives in the heat of summer. Dead heading keeps plants tidy and encourages long blooming. Full sun. 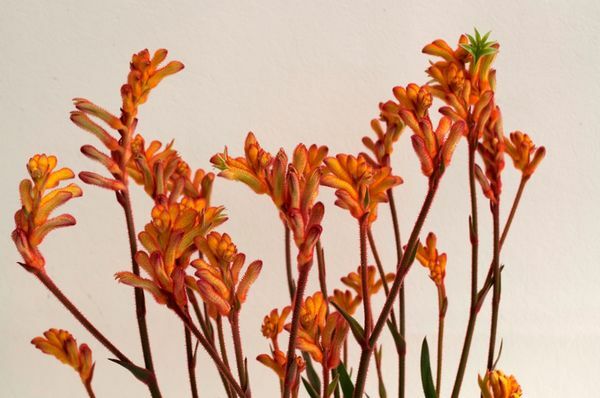 12"
'Flame' Deep burnt orange flowers and silvery foliage. 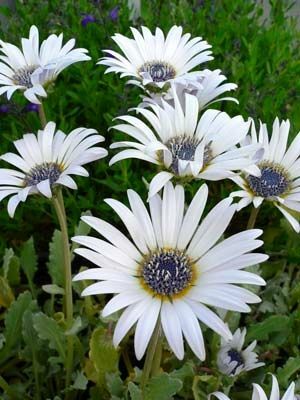 grandis (venusta) Velvety, silver foliage highlights its large, white daisies with a silvery blue tint. 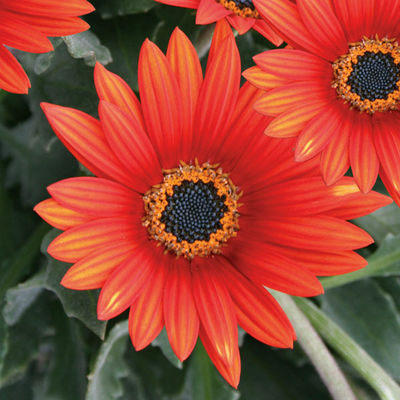 'Opera Fire' Large, showy flowers have single daisies with long, red-orange petals atop silvery grey foliage. Blooming in spring, then again in summer. 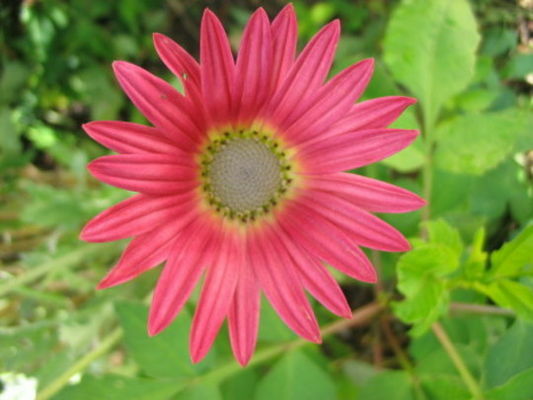 H 6-8"
'Wine' Rich, dark pinkish wine daisies arrive all summer long on compact plants. 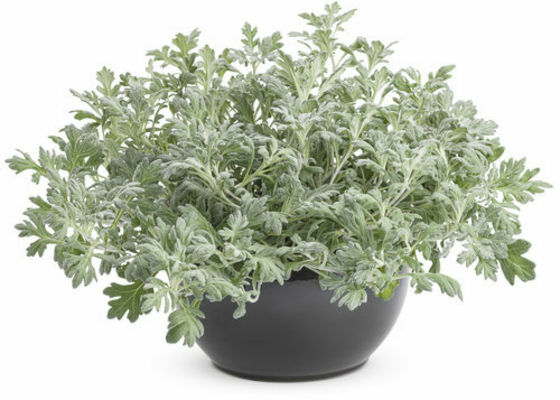 ARTEMESIA Grown for their silvery-green foliage and for their aromatic, culinary, and medicinal properties. Flowers are not showy. 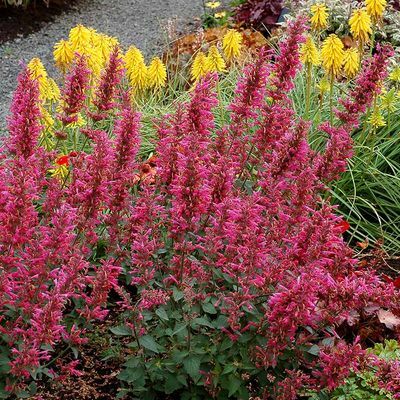 These plants are a good choice for rock gardens and other sunny, dry landscape sites. Grow in well-drained, fertile soil, in full sun. Most species take hard pruning, which will help keep plants compact. NEW! mauiensis 'Makana Silver' Foliage is silvery, soft and feathery, quickly growing into a billowy mound about 24" tall and 36" wide. Will make an exceptional accent in the garden or containers. stellariana 'Silver Bullet' FANCY, yet UNFUSSY. Silvery foliage. Plant as an accent/texture in combination in all container types and landscapes. H 6-10", trails to 24". ASARINA procumbens 'Iberian Trails' A wonderful genus of drought tolerant annuals. (See also Annual Vines.) 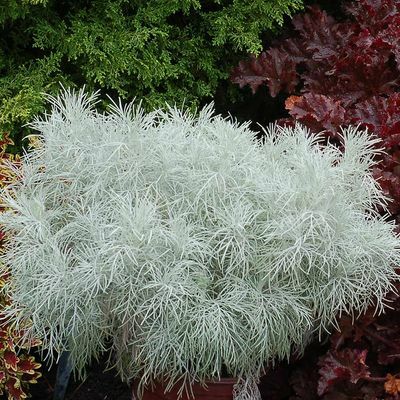 This variety has greyish green, fuzzy foliage trailing vigorously over the edge of containers. 1½”, soft yellow, yellow snapdragon-like flowers all summer. A subtle beauty. Sun to part shade. 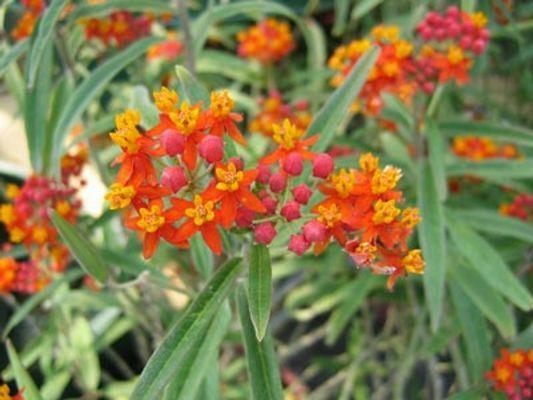 ASCLEPIAS (Butterfly Weed) Also referred to as milkweed, named for its milky sap. Many different species exist. An important nectar source for many insects and butterflies larvae. curassavica Striking flower clusters! Attracts butterflies and makes a great cut flower. Blooms all summer in full sun. Quite heat and drought tolerant. 'Red Butterfly aka Silky Scarlet' Clear scarlet outer sepals begin in a balloon shape and open around yellow upright petals. H 28"
'Silky Gold' Flowers are a solid golden yellow. 30-40"
fruiticosus 'Narrowleaf Cottonbush' (Swan Plant) Also known as Gomphocarpus fruiticosus. 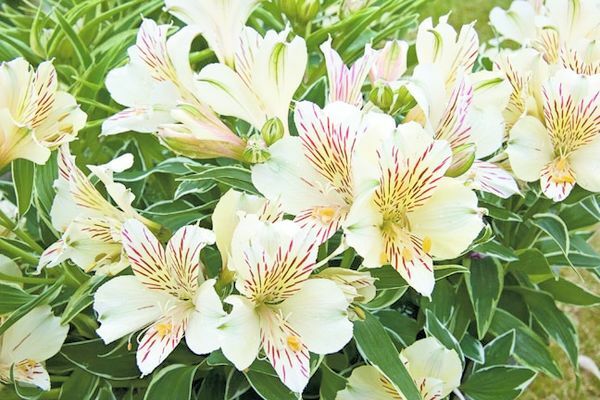 The star-shaped, white with pink, pendulous flowers, later turn to lime-green seed pods, which are fabulous for flower arranging, fresh or dried. Ideal nectar source. 3ft. ASYSTASIA gangetica 'Variegata' Small, pale pink, trumpet shaped blooms continue all summer held above rounded green and white variegated foliage. Does well in full sun to part shade. 6-12"